We have seen an explosion of new social organisms that don’t look like the old ones: Airbnb, Etsy, Black Lives Matter, #MeToo, Blockchain. If power in the Greatest Generation looked like Organization Men running big institutions, and power for the boomers looked like mass movements organized by charismatic leaders like Steve Jobs and Barack Obama, power these days looks like decentralized networks in which everyone is a leader and there’s no dominating idol. A book for all the innovators and disrupters, who refuse to be lost amongst the crowd, and choose to pave their own way. Drawing on examples from business, politics, and social justice, Jeremy Heimens and Henry Timms explain the new world we live in–a world where connectivity has made change shocking and swift and a world in which everyone expects to participate. "Self-made billionaire Richard Branson has a new favorite business book"
Self-made billionaire Richard Branson has another book to add to his long list of “must-reads”: “New Power,” by Jeremy Heimans and Henry Timms. The power shift is one that Branson, who started his first business half a century ago, has witnessed and one he thinks has the potential to do good. During the UK general election in 2010, an otherwise anxious electorate, rendered untrusting by a recent financial crisis, was offered a rare laugh. A Labour party election broadcast poked fun at Conservative leader David Cameron’s central social policy idea of “the Big Society” . His vision of a citizenry empowered to take control of their public services was lampooned with the image of a harassed working mother answering various hotlines between shifts manning local services in the absence of government employees. Years later, it is easy to scoff at the latest evangelists for a participatory revolution. They tend towards grandiose ideas to “restore vitality to our essential social functions” or even “reinvent democracy”, as Jeremy Heimans and Henry Timms put it in their handbook on how organisations can cope in a digital age. The calls are becoming deafening for an overhaul of how elites meet the public’s demands and harness ideas from new sources. Now that political and social movements such as #MeToo have demonstrated there is a different way to exert influence via social media, the authors are likely to find an eager readership for their book — including both those at the top of the tree, anxious to keep their perch, and the activists and upstarts at the bottom trying to shake them out of it. The “new power” in question is characterised as surging like a human current through peer networks and grassroots initiatives — in contrast to traditional old power, jealously guarded by leaders and hierarchies, that is handed down from on high. “Strength in numbers” is the idea that a group of people has more influence than just one person—that the collective is stronger as a whole. It’s also one of the guiding principles in “New Power”, a book by authors Jeremy Heimans and Henry Timms about the power dynamics in the 21st century. Heimans and Timms assert there is a new form of power, one that democratises and equalises our ability to create change. It’s what fuels movements like #MeToo and #BlackLivesMatter. But not every successful movement is an altruistic one. The “new power” principle can be harnessed by anyone. It’s one of the reasons ISIL and the so-called alt-right movement in the United States have been effective. So just how is new power reshaping our world and how do you turn a moment into a movement? Heimans and Timms will explain in this episode of The Stream. Back in 2012, 92nd Street Y Executive Director Henry Timms came up with a simple but powerful idea: a day all about generosity to follow the post-Thanksgiving shopping frenzy. Together with his team, Timms created #GivingTuesday, and its now-iconic heart-shaped logo, then started sharing the idea with the Y’s network. Their approach was fully inclusive, with no rules: Participants were encouraged to rework the logo, call the campaign whatever they liked, and invent ways to involve their own networks. Six years later, #GivingTuesday has grown into a worldwide movement, adapting and evolving with each community and nonprofit that adopts it (see our own GAgives), and growing year over year in participation, donations, and acts of generosity. The election of Donald J. Trump surprised many, most of all the Democrats. Jeremy Heimans, a political activist and the Founder of the online media company Purpose, explains it simply: Donald Trump won the internet, and thus won the presidency. Heimans is a political activist and the Founder of the online media company Purpose, explains it simply: Donald Trump won the internet, and thus won the presidency. It’s largely the same way the NRA stays in the public eye: through dominating the conversation. Trump and the NRA, for all their foibles, are both masters at what Heimans calls “New Power” — being able to seize the moment and keep people talking — and anyone attempting to beat him needs to become a master at it, too. Jeremy’s new book is the highly recommended New Power: How Power Works in Our Hyperconnected World-and How to Make It Work for You. Crowdfunding is having a profound effect on business. So much so that I believe that by 2030 all good ideas will be incubated through crowdfunding. Why? Because crowds, i.e. the opinion of the market, is deemed more trustworthy than the voice of a few opinionated industry leaders; pluralism is overtaking individualism. John Auckland from Tribefirst explains that there will be a time in the near future where ideas or new brands won’t be trusted if they can’t show they’ve been validated by the crowd. So how will this affect the startup and funding scenes, and will this help to drive the industry forward? And how can your idea gain more traction by embracing these new powers? It’s not often I use the term, “page-turner” to describe a work of nonfiction; however, this is an accurate description of New Power by Jeremy Heimans and Henry Timms. I took the book with me on a trip for work and found myself wishing the flights and layovers were just a little longer, so as not to interrupt my reading. I even read the book in my hotel room at night after the workday, which was a mistake a couple of nights because I found myself reading instead of getting the sleep I needed. The subtitle of the book is, “How power works in our hyperconnected world – and how to make it work for you.” What makes the book so compelling are the heavy doses of relevant examples sprinkled throughout each chapter. Some of the case studies are familiar, but many are not. The diversity of the case studies makes the work relevant to just about anyone interested in how to successfully navigate our world of instant communication and connection. As an aside, I appreciate how delicately the authors shared insights about politically sensitive topics without pandering to or demeaning either side of the political divide. The sensitive topics they explored made the book relevant to many of the issues we face today, and they did a nice job highlighting hot button topics without alienating people across the political spectrum. "New Power author Jeremy Heimans: 'Like it or not, the old world isn't coming back'"
There is nothing out of the ordinary about a book that makes one angry. We have all read ones that provoke us, and the internet is an inexhaustible feast for anyone easily outraged. It is unusual, however, to read a book that makes one mad with oneself. The co-authors of New Power could not be more likable. Clever, witty and creative, Henry Timms and Jeremy Heimans are baby-faced wunderkinds of digital activism; the type whose optimistic energy ought to make one feel hopeful for the future. So it is uncomfortable to confess that I hated almost every word, and wished more than anything for them to be wrong. The reason their book made me so cross with myself was that, if they are right, it means my way of thinking is old-fashioned and elitist – the very problem, in fact, they are trying to solve. The students of Parkland, Fla., top Fortune’s 2018 list of the World’s 50 Greatest Leaders, and the #MeToo movement clinches the third spot. Movements matter—today as much as ever. Individual crusaders when joined together can collectively topple corporate executives, undercut industries, upend elections, and wreak havoc on policy plans. With the advent of social media and other democratizing technologies, much is written now about “new power”—how decentralized networks often triumph over more conventional, top-down models. But new power is old news to social change makers. While every movement embodies collective leadership, not all campaigns are created equal. Some successfully coalesce around a common vision. Others fail to gain traction, spinning out of control or momentarily flaring bright, then fizzling. Whether a movement succeeds is determined by how it is led. Any group of impassioned people can mount a protest or organize a march on Washington, but social change making at the end of the day is an act of leadership. "Why crowdfunding heralds a new power, and what this means for small businesses and start-ups"
Jeremy Heimans is the co-founder and CEO of Purpose, an organization headquartered in New York that builds and supports social movements around the world. He is the co-founder of GetUp!, an Australian political organization with more members than all of Australia’s political parties combined. He has been named one of Fast Company’s Most Creative People in Business and received the Ford Foundation’s 75th anniversary Visionary Award. With Henry Timms, Jeremy is co-author of the book NEW POWER: How Power Works in Our Hyperconnected World – and How to Make It Work for You, forthcoming April 2018 from Doubleday. Their thinking on “new power” was featured as the Big Idea in Harvard Business Review, as one of 2014’s top TED talks with over 1.25 million views, and by CNN as one of the Top Ten Ideas to Change the World in 2015. The book “New Power” describes how to turn a moment into a movement. Co-author and 92nd Street Y Executive Director Henry Timms shares benefits of transparent, generous and “leaderful” organizations. “New Power: How Power Works in Our Hyperconnected World — and How to Make It Work for You” by Jeremy Heimans and Henry Timms, Doubleday Books In an era increasingly shaped by new power, this groundbreaking book offers us a new way to understand the world — and our role in it. "Business Books of the Month: April Edition"
Self-organising movements, from #BlackLivesMatter and Occupy to #MeToo and #NeverAgain, are hard to analyse. By definition, they tend to start from the grass roots and grow without obvious structure until they either attain a more formal structure or disintegrate. The authors have first-hand experience of the workings of “new power” — which is informal, collaborative, open and participatory. Jeremy Heimans is co-founder of Purpose, which helps oil the wheels of social movements, and Henry Timms, executive director of the 92nd Street Y, the venerable New York cultural hub, helped launch the #GivingTuesday campaign. "In Our Hyperconnected World, Dallas Leaders Find ‘New Power’ With Public Collaboration"
At least when talking about it in terms of “old power,” as outlined by authors Henry Timms and Jeremy Heimans, says Jennifer Sampson, president and CEO of the United Way of Metropolitan Dallas. Sampson read the 2014 Business Review article and noticed under examples of old power institutions, Timms and Heimans listed United Way. “That caught my eye and I didn’t like it. I don’t want to lead an old power,” said Sampson, who in 2011 became the first female CEO of the United Way of Metropolitan Dallas. How do ideas spread in today’s world? We talk to Henry Timms, one of the authors of the book New Power about why we need to rethink the way power flows through society. It’s well established that people no longer trust institutions but do institutions trust people? The conversation draws on examples from Tetris to Texas to demonstrate the characteristics of new power and you’ve ever wondered how climate change deniers are out communicating climate change campaigners then this is the episode for you. "Living in a New Power world requires new competencies"
The current legal and administrative infrastructure as well as economic systems in most countries are still very much unsupportive of such independent workers, entrepreneurs or people who take the risk of living and working outside of what Henry Timms and Jeremy Heimans refer to as the “Old Power” world of long-term stable jobs and affiliation, of professionalism and career paths, of competition and status. These tensions between enjoying the life of freedom I want and being able create my own reality every day on the one hand, and the uncertainty, unpredictability and responsibility this brings on the other hand, are increasingly going to be the life of many of those in my generation who see themselves as “makers”, who are unsatisfied with the world as it stands today, and who seek to create a new one by harnessing the collective intelligence and energy of the crowd — or what Jeremy and Henry call “New Power”. To be able to handle the tensions inherent in living in a world of New Power requires a whole new set of competencies which most of us have never learned at school, in our families nor in society at large. I’m old power. I have old power values. And I work in an old power model. This is one of the things that I learned by reading New Power: How Power Works in Our Hyperconnected World and How to Make It Work for You. The realization that I’ve spent my life in “Castles” hit me sort of hard. (My only non higher ed gig was at Britannica). Last week I spent a few days at ASU’s EdPlus unit. EdPlus is the learning innovation and online education unit of ASU. It is an institution whose culture most closely embodies new power values. "Social activists tell how to make the hashtag work for — not against — you in 'New Power'"
There’s real power in those hashtags — just ask Harvey Weinstein and Starbucks. They’ve learned the hard way that the wrath of social media can be swift and ferocious. None of this is a surprise to Jeremy Heimans and Henry Timms. Together they’ve written New Power: How Power Works in Our Hyperconnected World — and How to Make It Work for You, released by Doubleday earlier this month and now the publishing company’s hottest title. "Business Books to Watch in April"
"The ‘New Power’ Generation: A Manifesto For A More Humane World"
Heimans and Timms join us to explain how it applies to modern movements, from MeToo to the youth-led call for gun legislation after the shooting in Parkland, Florida. "For your reading list: We review 3 intriguing business books"
We live in an increasingly connected, globalised world. Movements like #MeToo or the alt-right, corporations like Facebook or Uber – the explosion of these ideas demonstrate the changing nature of power. No longer static, power is now chaotic and mutable, and ordinary citizens may find themselves in power one day, and then lose it the next. "New Power: An Interview with Henry Timms"
Heimans and Timms spent three years talking to practitioners, academics and researchers on the cutting edge of what they call new power, which flows from what they think of as the essential skill of the 21st century: the ability to harness the energy of the connected crowd. Their research and conversations took place all around the world and included everyone from the heads of intelligence agencies in Washington to frontline health workers in the Netherlands. They write about the battle and balance between old power to new power, and show how they’re fueling the defining transformation of our times. But like all fast-moving trends, sometimes it’s hard to see it clearly when we’re right in the middle of it, which makes New Power just that much more important. It’s a guide to spreading ideas, launching movements, raising money and much more. "#DeleteFacebook Is Just the Beginning. Here’s the Movement We Could See Next"
A few years ago, you may remember seeing Facebook (FB, +0.91%) posts like this dotting your newsfeed. The posts were based on an urban myth. The Rome Statute in fact covers crimes against humanity, not Facebook’s relationship with its users. But the popularity of such posts remind us that the #DeleteFacebook movement we have seen in recent days has much deeper roots. Continue reading to see more of the Fortune adaption from Henry Timms and Jeremy Heimans book New Power. "The Nonprofit Book We’ve Been Waiting Four Years To Read Is Finally Here"
New power is not just a passing trend, it matters for civil society. Connectivity and platforms like Facebook can bring us closer together and inspire amazing work or they can be weaponized to drive us further apart as we’ve been witnessing over the past 18 months. May 4th, 2018 — Asheville, NC — Not being a climatologist, meteorologist, or environmental health specialist is a challenge when you are trying to raise awareness of the exposure impacts of the weather and the environment on health. However, that’s because the model for the distribution of weather and environmental knowledge and information is based on old power. We have a system that distributes weather and environmental exposure information to the masses when in fact individuals are sensitive to these exposures uniquely. In the case of environmental factors, if physicians did not understand the impacts of outdoor weather or environmental exposures on an asthma patient, or they felt the correlation was insufficiently validated, it was neglected. Asthma educators arose, in part, because physicians were not sufficiently educating patients about the triggers that could cause negative health outcomes. This is in part because we lacked the infrastructure that is emerging today; wearable sensors, big data, and machine learning that could inform physicians of the exposure impacts on their patient. "Jeremy Heimans: To truly defeat the NRA, we have to learn from them"
Jeremy Heimans believes he’s figured out the secret to the National Rifle Association’s power — and it isn’t necessarily what you think. "raceAhead: Finding New Power At Work"
Rather than parrot the now familiar tech-topia talking points of “democratization” and prosperity through connectivity, the authors offer both context and practical advice that one can use to succeed in a tech-enabled world that’s profoundly imperfect but ever-present. "There are fewer wars when you take power away from men in big castles"
Those who have power want to be told they have it and how to keep it. Those that don’t have power want someone to envy. As a result, the audience for books on power is seemingly endless. So I was initially cautious about another one released this week – but New Power by Jeremy Heimans and Henry Timms turns out to be a nifty guide to the 21st century that is genuinely new. Instead of one more catchy way of describing how the world works, they have written a manifesto for organising that world with more humanity and purpose. Ultimately you’ll either hate it or wish you had written it, depending on whether you believe in old or new power. Interview with Henry Timms on 14th & G.
This week on 14th & G, we welcome thought leader Henry Timms onto the show to discuss his book, a national bestseller, New Power. Timms is the Executive Director of the 92nd Street Y, a cultural and community center that creates programs and movements that foster learning and civic engagement. Our discussion will examine the fate of traditional institutions in the face of newcomers able to harness the energy behind a connected crowd. "Putting ‘New Power’ to Work in Philanthropy"
A rich and deeply researched new book expertly delineates the fundamental shift in how people get things done in a hyperconnected world, offering lessons every foundation and nonprofit leader should heed. "Gist: James Comey's Ego Trip"
On Monday’s Gist, we’re counting Pulitzers and powering up. Jeremy Heimans and Henry Timms sort power into two categories: old and new. Old power is like Congress: top-down, official. New power is like Facebook: decentralized, crowd-sourced. What is the best way to meld both kinds of influence to improve our lives? Heimans and Timms have the beginnings of an answer. They’re the authors of New Power: How Power Works in Our Hyperconnected World – and How to Make It Work for You. In the Spiel, James Comey does seem ego-driven. That’s not always a bad thing. New Power – A Blessing or A Curse? On its surface, New Power looks like a breathless book by two social media experts about how decentralized power is changing the world for the better. Occupy, MeToo, Black Lives Matter, the Ice Bucket Challenge, and even Oreo Cookies have shown, Jeremy Heimans and Henry Timms say, that New Power is people’s power, decentralized power, peer-generated power that can be channeled but not managed from on high. “It’s only a movement if it moves without you,” they say. Reading the book, however, I found myself growing more pessimistic, conservative, elitist, and crotchety. After all, right-wing populist movements like the Leave campaign in Britain, the Tea Party and MAGA movements in the U.S., and many others utilize “New Power” too, often more effectively than their progressive or centrist opponents. The more I read of New Power, the more old and embittered I felt. Lucky for me, both are also in my own New York, Jewish, and (in Heimans’ case) gay orbits, so I decided to treat this interview like getting a round of drinks with these guys, playing devil’s advocate, and leaving the jokes in the final transcript. Here’s what went down. "For Summer Reading, Check Out These Books"
New Power: How Power Works in Our Hyperconnected World — and How to Make It Work for You by Jeremy Heimans and Henry Timms (2018, Doubleday). The authors demonstrate how today’s interconnected world puts power in the hands of many rather than a few, and they explain how this “new power” is redefining how we work, who governs us, and more. In today’s hyper-connected, globalized world, where new social-political reckonings catch fire overnight, the stakes have never been greater for brands to mobilize their audiences—inside and outside their four walls—to take a stand together. "A World Without Social Media: Would That Be A Force For Good?" Power is shifting back into the hands of the people. There has been a revival in grassroots civic engagement, with social media giving both a voice to those silenced, and a means to galvanise. Social media is now one of the main tools for raising awareness on important issues and pushing for reform, a topic also discussed in the new book, New Power by Henry Timms and Jeremy Heimans. "New Power in the 21st Century. What are the Forces Reshaping Politics, Business and Society?" So, if we accept that the world is changing and that the dynamics of power are changing with it, what then? How is this battle between old and new power determining who governs us, how we work, and even how we think and feel? How can understanding new power dynamics help us reshape the world around us in a positive way? What can the distribution of power in the 21st century tell us about how the future is going to unfold? Is our ability to mobilize the mass of humanity in previously unimaginable ways a net positive development for the aims of egalitarianism and progress? "Power play: An account of the rapidly evolving new world marvels at the ability of social media"
New Power by Jeremy Heimans and Henry Timms. For most of human history, power was something to be seized and guarded. We lived in a world of rulers and subjects. But something has changed. From Jeremy Corbyn to Donald Trump; from taxis to B&Bs; from YouTube sensations to the emergence of ISIS; in our new hyper-connected world, ideas and movements can spread and flourish with astonishing force and speed. Jeremy Heimans and Henry Timms confront some of the biggest stories of our time and trace how ‘new power’ is the key to understanding where we are and who will prosper in the 21st century. "New Power: A story of broad engagement and change in a large healthcare organization"
One of our organizational key strategies was having trouble getting traction. After two years of broad public consultation and the anointing of a steering committee there was still very little action beyond engagement and planning. Although the Patient First strategy is one of four pillar strategies within Alberta Health Services (AHS), and even though it was central to health services becoming more patient and family centred, many staff and leaders expressed confusion about what Patient First was, and what it meant. Direction and planning was done by a select few people across the organization. It was clear something had to happen. Success depended on broad engagement from staff and patients to help make services better. Using Heimans and Timms definition, boards of directors have been quintessential old power. It is becoming evident, however, that these homogenous boards comprised of the anointed actually stunt corporate growth. "A new way to be powerful in a world that feels out of control"
From the out-of-nowhere victory of Donald Trump, to the insurgency of movements like #MeToo, to the growing power of platforms like Facebook to tweak our daily thoughts, feelings and habits. Of course technology is changing, but we are also changing. To really understand what’s happening around us, we need to reckon not with changes in technology, but shifts in power. Most of us grew up in a world built on old power. We had relatively little agency. Institutions like schools or the factory floor set narrow terms of engagement. We complied. We consumed. We paid our dues and played our part. It was a world built largely on “download”. But in the early 21st century our ubiquitous connectivity has handed us what we can think of the new “means of participation”. "Let's Make New Power a Force for Good"
I’ve been loving reading “New Power”, launched just last week. For me New Power is more than a book. While it gives plenty of examples of movements, I am experiencing New Power itself to also be a movement. I read the forerunner article on New Power some time ago and I kept using the hashtag #newpower in my tweets. Yes, there was something about that article that spoke to me and I wanted the world to know about the ideas! I was surprised and delighted when authors Henry Timms and Jeremy Heimans in recent times reached out to me (and lots of others) to help with the launch of the book. As I read New Power it makes more and more sense why they contacted me. I’ve been a early adopter. They made a reasonable assumption that I would get on board now. Engaging people like me is part of their strategy for movement building. People like me will take hold of the idea, add additional meaning to it and spread it to further progress consciousness of power in our societies. "New Power and the Dynamics of Digital Change"
If you are looking for a fresh and comprehensive analysis of how the Digital Age is transforming the civic arena, get yourself a copy of New Power, Jeremy Heimans and Henry Timms’ new book, which is being released today. "Important new book : New Power"
At last there is “New Power”, a book that describes how to bottom-up WEAVE Online Communities into swarms of Positive Participating People. Cases are analysed in which people interconnect, participate, cooperate and contribute meaning that can be synthesised, so it creates value by synergy to all participants. This can scale up into a type of society I call “The #Synthecracy”. Its Message is in the Connections with Others. "3 Ways to Harness the 'New Power' That Let Airbnb, Kickstarter and Other Companies Climb to the Top"
Although the literary definition of power hasn’t changed, recent years have seen a shift in its cultural meaning. There’s a reason why the likes of Airbnb have overtaken Hilton in revenue, argue Timms and Heimans. Simple investing apps with a focus on accessibility continue to grow in popularity, even as large investment management companies seem to rest on their laurels. “New Power” authors Jeremy Heimans and Henry Timms discuss how people can obtain power in the 21st century. "TYT Interviews – Jeremy Heimans & Henry Timms"
Cenk interviews authors of “New Power” Jeremy Heimans and Henry Timms. Life in Facebookistan: Speaking to Vox’s Ezra Klein a few days ago, Facebook CEO Mark Zuckerberg pointed to the company’s detection and blocking of malicious messages flowing through Messenger from inside Myanmar, inciting Muslims and Buddhists to arm themselves and go fight each other, as an example of how it is taking seriously its role in that country’s civil strife. A new book on so-called “new power” has attracted endorsements from a glittering array of public figures, ranging from entrepreneur Sir Richard Branson, comedian Russell Brand and primatologist Jane Goodall to former Australian High Court judge Michael Kirby. According to the book’s authors, Jeremy Heimans and Henry Timms, the differences between “old power” of the 20th century and “new power” of the 21st century are the approaches to governance, competition, sharing of information, expertise, and loyalty and affiliation. In the new power paradigm, collaboration and crowd sharing are valued. Transparency and a do-it-yourself culture are favoured over secrecy and relying on experts. Affiliation to groups is not reliant on long-term loyalty; rather, short-term affiliations can lead to greater public participation. Heimans and Timms argue that new power values have moved away from formal governance structures to informal (or networked) governance, allowing individuals to opt-in. Sharing ideas from their new book, Jeremy Heimans and Henry Timms share the 5 steps to build a movement today. There are three design principles key to making an idea spread in a new power world. Ideas that take off are actionable, connected, extensible (ACE). How do we make sense of a world where the unexpected keeps happening? Whoever mobilizes is going to win, and if you end up understanding new power, you can end up on top. Welcome to the new power world. A way to understand the interplay between old or new power models and old or new power values. 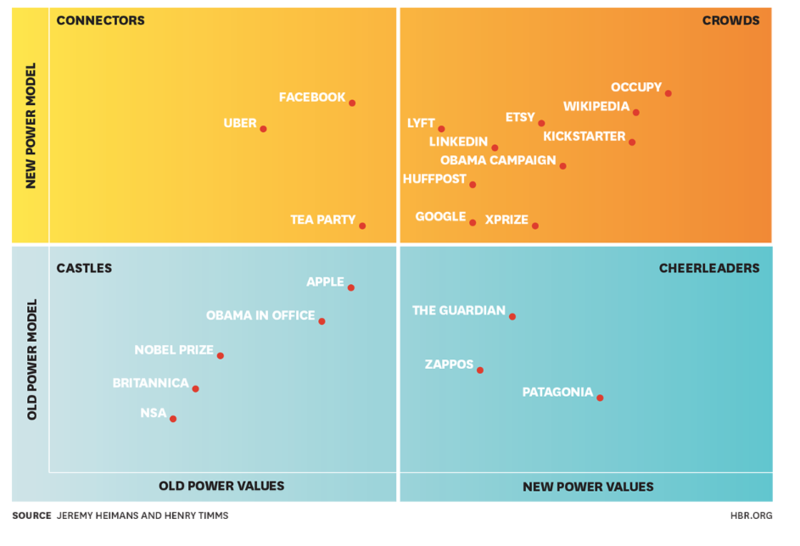 The horizontal axis tracks the values of an organization: whether it exhibits new or old power values. The vertical looks at its model: whether it is a new power model designed and structured to encourage mass participation and peer coordination or an old power model that asks us to do little more than comply or consume. There are two big forces at play in our world today: old and new power. New power is made by many, it is open, participatory, and peer-driven. It operates like a current and, like water or electricity, it’s most forceful when it surges. The goal with new power is to channel it. The most effective new power models know how to move people up the “participation scale” from low barrier actions to larger ones. Looking at the values and leadership models people are using, we see four different leadership archetypes. The new power phenomenon is about more than competing power structures, it’s about a competing set of values. In a new power world, there’s a belief in informal governance, opt-in decision making, collaboration, radical transparency, maker culture, and short-term affiliation. Share how you've seen and used new power in your life. The future will go to those who know how to mobilize around New Power, and right now it’s up for grabs. Send the book to the people, the organizations, the businesses you want to win. Critics and everyday readers are calling New Power the ‘must read of the year.’ Add in your own review of the book. New Power shines fresh light on the largest phenomena of our day: from #BlackLivesMatter to Airbnb to the election of President Trump, these ideas unpack the new power forces that make them huge.